August has been a month full of subtle changes. Farmers markets are overflowing with tomatoes and zucchini has been made into all things edible. 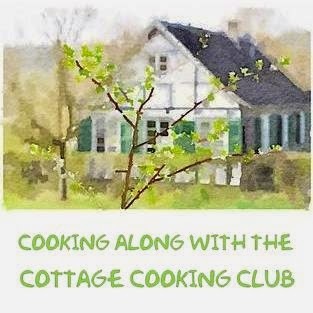 It is also the fourth month of the Cottage Cooking Club that is hosted by the talented Andrea of The Kitchen Lioness. We are all cooking along with Hugh Fearnley-Whittingstall's cookbook "River Cottage Veg". I prepared 2 of the 10 selected recipes and was once again very pleased with the results. The first recipe I prepared was the Tahini-dressed zucchini and green bean salad. Here the salad is a mixture of raw and cooked ingredients. I loved everything about this dish except for how long it took to prepare. There were 4 different components, the tomatoes, green beans, zucchini and the dressing. The tomatoes will need to be prepared the day before or early in the day of your meal. This step alone will take 4 to 5 hours as they are slowly oven dried which will condense and intensify the flavor. The zucchini is cut into coins and pan-fried with a little olive oil until tender and browned around the edges. The green beans are blanched so that they are crisp-tender. Finally the tahini dressing is prepared. This is the magical combination that pulls all these amazing flavors together. It is delicious! The second recipe was the gazpacho. A gazpacho is traditionally a chilled Spanish soup that is made up of raw vegetables. Here the tomatoes were the lone star of the dish and carried the weight themselves. This is why it is so important to wait and make this soup when summer tomatoes are at their best. My gazpacho was crunchy from the cucumber, red onion and red bell pepper. The recipe called for two thick slices of bread to be added. This recipe was easy to prepare and loved by all. The soup was served with homemade croutons and a garnish of chopped basil. Bon appetit! I followed both recipes very closely, but you could easily change out some of the vegetable combinations to make it your own. The tahini dressing would also be great on a lentil salad or drizzled over eggplant. Recipes adapted from "River Cottage Veg", by Hugh Fearnley-Whittingstall, first recipe cookbook chapter Hearty Salads, Tahini-dressed zucchini and green bean salad, page 74. Second recipe cookbook chapter Hefty Soups, Gazpacho, page 137. To see what recipes the other members chose for this month, head over to the LYL post for August on the CCC website, by clicking here. Both recipes look fantastic, Cheri. I will have soup first, then salad with a large slice of rye bread for the lunch. I love that cookbook! Despite the amount of time needed to make it, I'd like to try the green bean salad. Every one of his recipes I've tried has been great, and I'm sure the salad would be no different. Hi Beth, i agree, that green bean salad was very good, loved the tahini dressing. I love the zucchini green bean salad with tahini dressing. I am tasked with bringing the vegetables to a cookout this weekend this would be perfect because my shopping will be from the green market on Saturday and tomatoes and zucchini abound. Hi Suzanne, how fun a cookout! Have a great week-end! It all sounds divine and inspiring. I especially like the idea of the gazpacho with crunchy vegetables. Perfect for now when I have 5 pounds of luscious tomatoes on the counter! It's great you've been doing this cooking club. Cooking can be isolating, so nice to share it with others...And with us. Thank you, Cheri. Thanks Dena, the cooking club has been fun, it is fun sharing like this. both dishes sound great, but especially that salad. The steps do sound tedious, but the overall effect must be delicious - I love slow-roasted tomatoes! Hi joyt, I loved the slow roasted tomatoes too, they were perfect with the salad. I've never tried gazpacho, but I think I might need to try it now! Tahini-dressed zucchini and green bean salad sounds like exactly my sort of dish. I might cheat and use store-bought oven dried tomatoes though for a quick weekday take on it :) I'm loving this book, but I can't decide what to make first! Hi Amy, it is a great book, love his cooking style. Thanks! I love the sound of that salad -- I can't get enough of those veggies right now! Hi Marie, summer veggies are the best! Cheri, your Tahini dressed zucchini and green bean salad looks and sounds fantastic! It seems the required extra effort of steps are worthwhile in the flavorful dimensions of depth each ingredient provides, then as they harmoniously blend together. PS- due to our temperate summer on the East Coast, our usually thriving tomatoes and zucchini's have not! Better make a farmers market run shortly, been too busy picking peaches! See you soon. Hi Peggy, so jealous of your peaches! had fun this month cooking as a group. I agree that the tahini dressing was the star of the salad (and it was delicious with eggplant as you suggested). And you made the oven dried tomatoes! I'm sure they added lots of flavour to the salad. Your gazpacho looks lovely and refreshing - perfect for a hot summer's day. Hi Zosia, next time I will oven dry many pounds of tomatoes at once and use them for other things. Had fun Zosia! Thanks! Hi Charlie, tomatoes are growing like crazy here and they are at their best. Have a great week-end! Tahini is a versatile dressing and I love it! Thanks for sharing!!! Hi Julie, tahini is so versatile, loved this dressing! I love gazpacho, it's such a refreshing summer dish. And healthy too! Hi Mike, I had fun cooking as a group to make this! Thanks! Hi Dedy, thank you, it was refreshing. I love the salad Cheri! Hi Gloria, thanks it was good! That salad with those dried tomatoes looks absolutely delicious! Hope you have a great weekend! Hi Cindy, thanks you too! Cheri, thank you so much for participating again in August - so nice to read that you really enjoyed the tahini-dressed salad as well - I could not agree with you more, the delicious end result was worth all the effort that went into making this! And your gazpacho looks like a dream of a delicious late summer soup! Hi Andrea, thanks for hosting the Cottage Club, appreciate all that you do! These look like great veggie recipes–thanks for sharing! Thanks Nancy, have a great week-end! Hi Tandy, I tried this with cherry tomatoes first and forgot about them in the oven. As you can guess they were ruined, used the larger ones for this. That salad could wake up the taste buds of anyone. I just love it. That gazpacho looks delicious! Hi Maureen, the salad was my favorite but the gazpacho was good too and very refreshing. 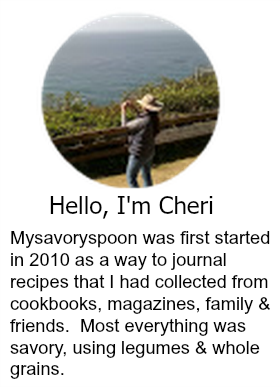 Cheri, your dishes are lovely! Two that I did not make this month, so it's fun to read and see about them. Both look wonderful! Hi Candy, appreciate you stopping by, thanks you too! I love shopping the farmers' markets and farm stands this time of year! Two beautiful recipes with the best summer has to offer. Thanks Susan, I agree this is such a great time of year for the markets. Oh, you made the oven-dried tomatoes! I so wanted to, but did not have the time to make them. Still the salad was wonderful, even with fresh tomatoes. Hi Cathleen, I really enjoyed this salad, the first batch of tomatoes I forgot about and they burned, second batch was good. Your salad and soup look so summery, Cheri. I would like to try the salad. The way you break down the description makes it sounds more manageable. I will try that one before the summer's over. This book has so many delicious choices! Hi Betsy, yes I really like the one he gives several suggestions for each recipe. Hi David, the dressing is amazing! Have a safe trip! Your gazpacho has a beautiful hue! I made the salad, too, and really enjoyed it. Hi Teresa, the salad was my favorite, thanks! Love your Post Cheri. Enjoyed your description of directions in preparing the salad. Both of your selections look great. Lovely, thanks for sharing! Thanks Peggy, it was a fun post for sure! Loving the idea of the tahini dressed zucchini - sounds delish.